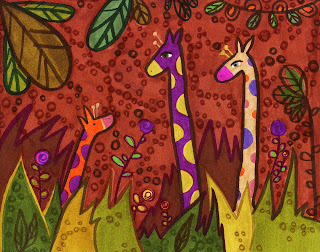 New jungle animals are now available as prints in my 'fun art portfolio' section. Which is better than bringing home actual jungle animals -since the K8 Art version probably won't gobble up your children... Probably. Oregon Music New's reviews The Verve Pipe "Family Album," that I did the illustration for, gives me a mention. Read it here. And if you haven't picked up TVP's "Family Album," what are you waiting for?! Get one today! It's not been an easy year for Landon and his wife Heather. Personal tragedies have rocked their world, causing them to be in a state of sadness. "I stumbled upon an article interviewing you in the NOISE. I was curious, so I looked up your blog and from there started looking through your artwork, the entire time with a big smile on my face. With everything going on, it feels very good to be able to forget about everything for a moment and smile," said Landon in an email to me. I can't think of a greater compliment than that! Except maybe that he then took it a step farther... Landon went right out and visited 2 galleries that sell my art. He then purchased a piece from each (without the blessing of Heather...) ... Fortunately she fell in love with 'Charlie the Turtle,' and all was right with the world. 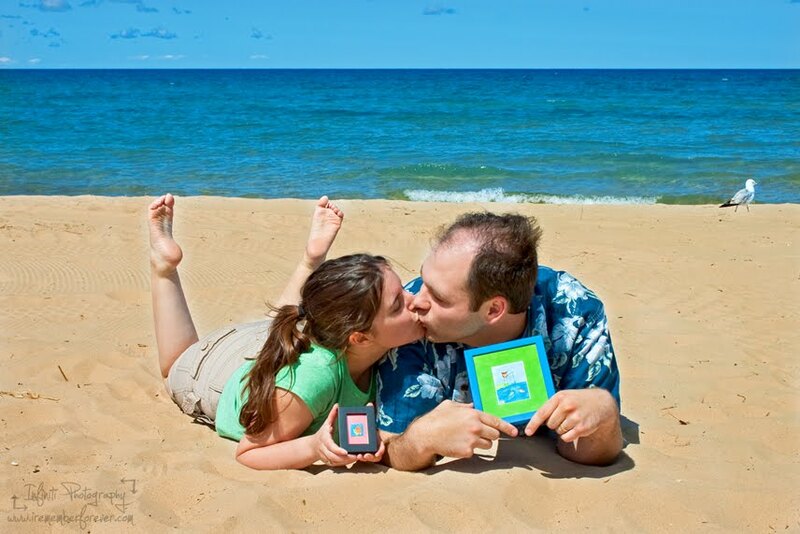 **photo of Heather & Landon with their pieces, on a much-needed beach getaway. When I wished them better luck, he said something that struck a chord with me: "My wife and I are raging optimists, despite the tough times we believe good things are close around the corner." A mantra I (and a lot of people I know) definitely need to adopt! Thanks for spreading the hope, and the art! 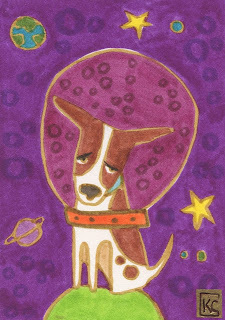 This ACEO of the week was inspired by me wondering about the Russian Space Dogs this week...Were they homesick for earth? Don't miss out on taking this dog to your home planet!